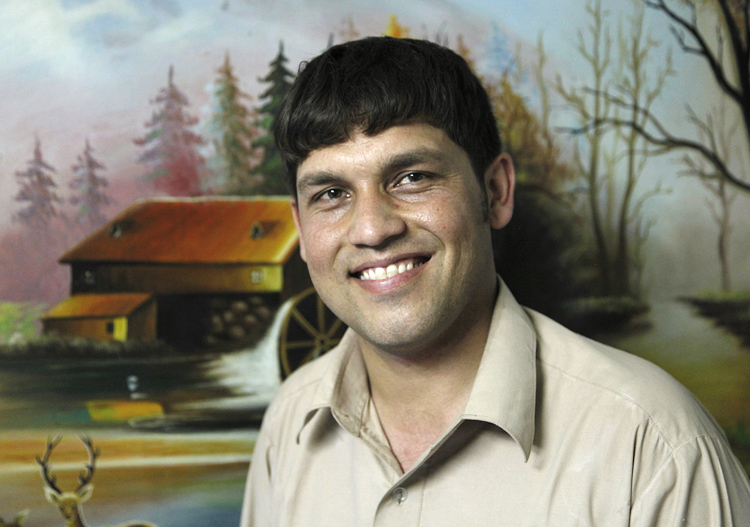 We first met Sayed Ismail and his son Sayed Mahboob in 2006 after we noticed a kamra-e-faoree standing outside of their photo-studio, near the Shrine of Hazrat Ali (the 'Blue Mosque') in Mazar-e-Sharif. 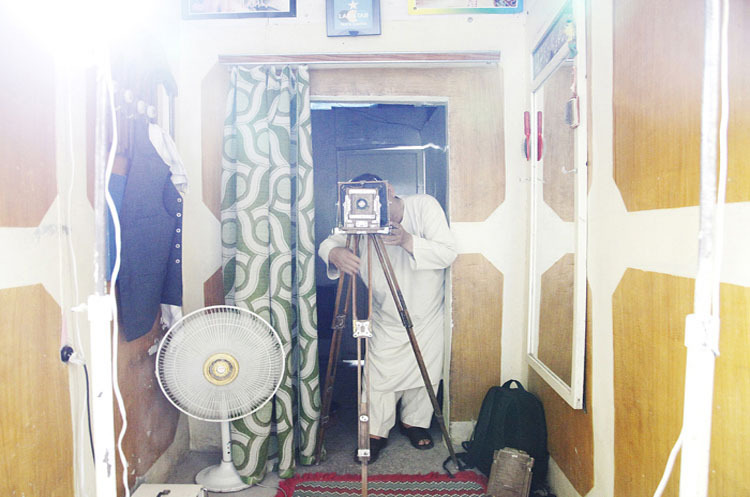 It turned out that Sayed Mahboob had photographed with a kamra-e-faoree in the past: when the Taliban were in power he took identity photographs of inmates at a prison in the city. But the camera that drew us into their shop was defunct, and they only used it to advertise their services. Not knowing this, we went inside to investigate and came out sometime later with a couple of hand-coloured portraits; they were taken with this large format camera by Sayed Ismail below. A short video of Sayed Mahboob making a contact print from a large format negative can be viewed here. During this visit, Sayed Mahboob helped us with our research by digging out an old encyclopedia from the time of Zahir Shah, who ruled Afghanistan from 1933 to 1973. The pages, he pointed out to us, explain the process of photography using the same type of large format camera they took our portraits with five years previously. The book belongs to his family. When we saw the book, we told Sayed Mahboob that he must be very interested in history. 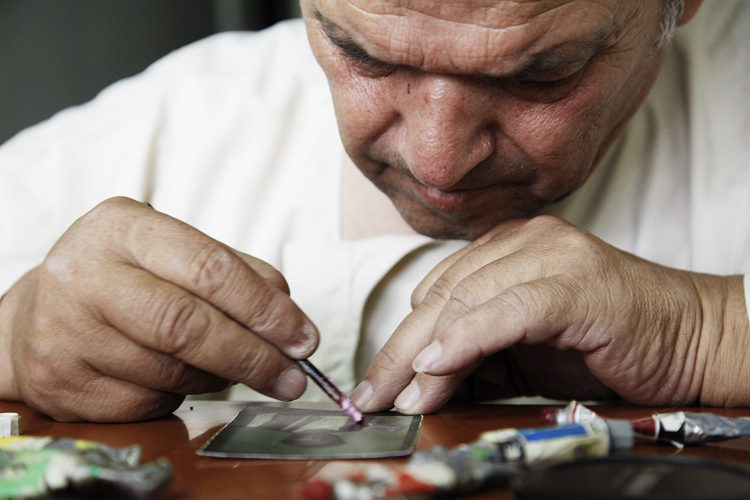 "I'm not interested in history," he replied, "only in the time of Amanullah." Amanullah was a reformist head of state who ruled Afghanistan from 1919 to 1929. During his reign he tried to spread western ideas and modern technologies. 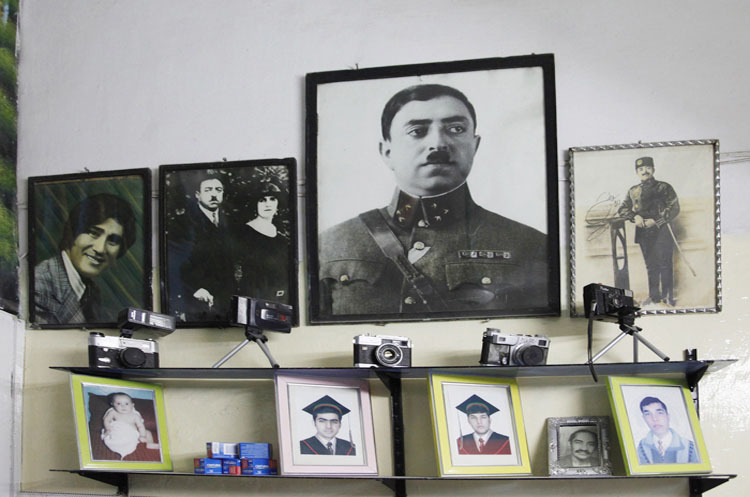 In the picture below, which hangs on the right-hand side of the Zakri photo-studio, portraits of Amanullah and his wife, Queen Soraya are displayed next to and over family photographs and cameras.